Some of you might have noticed that there's precious little bird poop in Canary Wharf, and we're going to explain why. This is Lemmy (the little chap on the right) and he is a Harris Hawk. 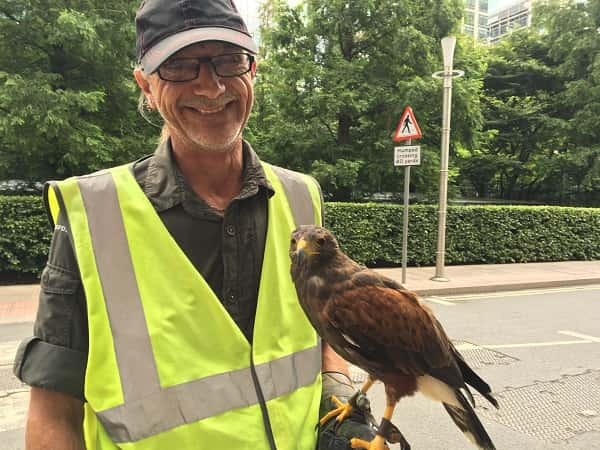 If you work in Canary Wharf you might have seen him around, either up in the skies, or exactly as you see him now, on Paul's arm (he's the chap on the left). Lemmy's job is to keep the birds away. Have a think, when was the last time you saw a pigeon in Canary Wharf? Let’s be frank, the Isle of Dogs doesn’t have a ‘centre’ as such, and it certainly doesn’t have a High Street, so with no obvious place start a day or night out on the Isle of Dogs we’re going to have point you in the right direction. DLR: The Isle of Dogs is well served by the Docklands Light Railway, which runs through the middle of the Island from South Quay at the top, then down through Crossharbour, Mudchute, and Island Gardens. Going on from South Quay is Canary Wharf, Bank and Tower Gateway, plus connections to Stratford and the rest of the DLR network. Island Gardens leads to Lewisham, via Greenwich. DLR trains run every 3-4 minutes at peak times. Right now, the majority of residential development is happening to the north of the Island where Canary Wharf meets South Quay. Already underway is the Canary Wharf Group’s redevelopment of Wood Wharf, completing in 2023, Berkeley’s South Quay Plaza (2020), Galliard’s Maine Tower at Harbour Central (2019/2020), Ballymore’s The Wardian (2019), LBS’ The Madison (2019), Mount Anvil’s Dollar Bay (2017) and Galliard’s Baltimore Tower (2017).